Raise your hand if you love eggs. Now raise the other if you hate cleaning up. Well, meet your new favorite recipe. 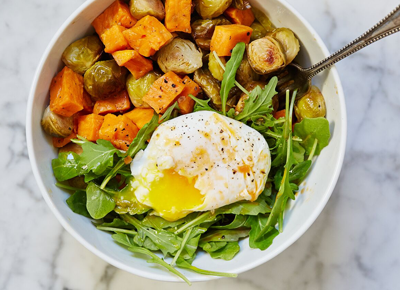 This sheet-pan egg dish is basically the perfect meal, which you can serve for breakfast or dinner. 1. Preheat the oven to 400°F. Grease a baking sheet with non-stick cooking spray. 2. Arrange the asparagus and cherry tomatoes in an even layer on the baking sheet. Drizzle the olive oil over the vegetables; season with the thyme and salt and pepper to taste. 3. Roast in the oven until the asparagus is nearly tender and the tomatoes are wrinkled, 10 to 12 minutes. 4. Crack the eggs on top of the asparagus; season each with salt and pepper. 5. Return to the oven and bake until the egg whites are set but the yolks are still jiggly, 7 to 8 minutes more. 6. To serve, divide the asparagus, tomatoes and eggs among four plates.